Develop your students addition and subtraction skills with this engaging activity. 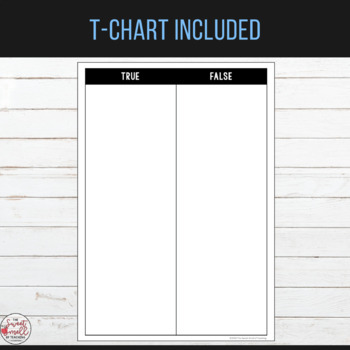 Great for math rotations! Students will use their problem-solving skills to work out equations involving addition, and subtraction. Each card will display a number sentence. Students must determine whether the number sentence is correct or not. If true, they will move the challenge card under true. If false, they will move it under false. 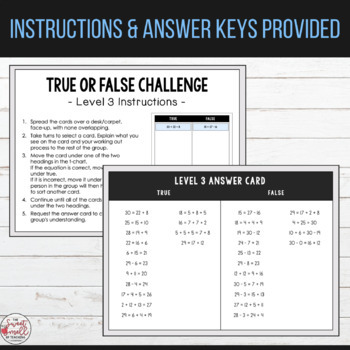 Students will need to use algebraic thinking, reasoning skills, communication, and critical thinking to classify all of the 28 challenge cards in each set. 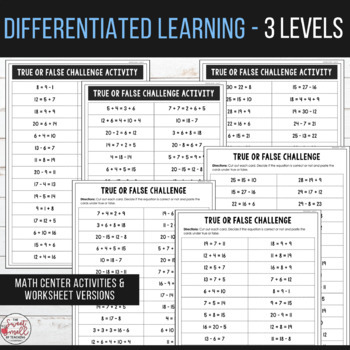 Activities become progressively harder as students proceed through each level. Advanced students will move through to the level 3 challenge cards. 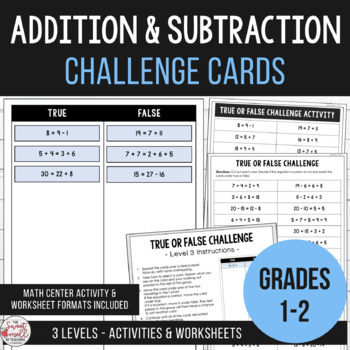 Those experiencing difficulties may remain on the level 1 challenge cards to practice the basic concepts involved with addition and subtraction. Number sentences involving addition and subtraction within 20. Number sentences involving addition and subtraction within 20. Difficulty increased. Number sentences involving addition and subtraction within 30. Instruction and answer cards for each level have been supplied.